The Turing Test (game, 2016). A first-person puzzle video game by Square Enix Ltd./Bulkhead Interactive. Developed by Square Enix. Official Trailer. The Turing Test is a first-person puzzle video game by Bulkhead Interactive and Square Enix Ltd., developed by Square Enix. 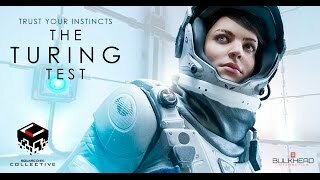 The Turing Test - Release Date Trailer. In the far future, engineer Ava Turing is one of several members of a research team sent via the International Space Agency (ISA) to excavate Jupiter's moon Europa. While Ava remains in cryogenic slumber, the other team members are woken and travel to the moon to set up their base and begin conducting their studies, with Ava scheduled to wake once the base is completed. Sometime later, Ava is awoken by the Technical Operations Machine (T.O.M. ), an artificial intelligence that monitors the project. T.O.M. tells Ava that her crewmates are in danger and she needs to go down there to help them out. She quickly sets out in a lander and enters the base on Europa. T.O.M. quickly recognizes that the base's internal configuration has changed from their records, whereby to progress further into the complex, Ava must complete various tests (designed as the puzzles in game). As Ava gets deeper in the complex, T.O.M. determines some of the team members are already dead and the others need their help, urging Ava to move faster. As the tests get harder, T.O.M. realizes that these are designed to be solved by a combination of human and artificial intelligence, a manner similar to that of the actual Turing test. They enter an area where one of the remaining crew-members, Sarah, warns Ava over the communication systems that she is actually being controlled by T.O.M. due to a special chip implanted in her hand when they left for the mission. Sarah directs Ava to a Faraday cage, which temporarily frees Ava of the control from T.O.M., revealing in the process that the player has not been playing as Ava, but as T.O.M., who has been controlling Ava. However, T.O.M. manages to convince Ava that the two of them need to continue to work together to save their colleagues. Though angered by the intrusion of T.O.M. into her body, Ava continues onward, allowing T.O.M. to reassert control over her body. The Turing Test is a puzzle video game with gameplay experienced from a first-person perspective. The player assumes the role of Ava Turing, an International Space Agency (ISA) engineer working at a research station located on Europa, one of Jupiter's moons. 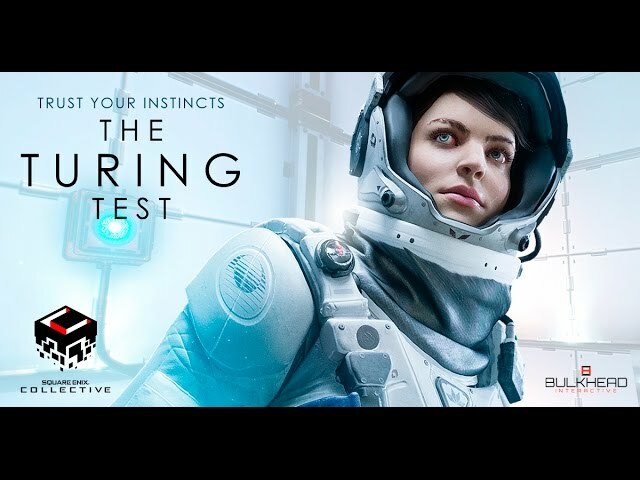 The Turing Test was scheduled to be released by Square Enix Ltd. and Bulkhead Interactive on August 30, 2016, on November 23, 2016, on January 23, 2017 and on January 24, 2017.